But it’s not early days for VR. Stanley opened his store more than twenty years ago—that NYT article is from August 7, 1995. Stanley was right about being early, but slightly off by how much. I’m not sure how things ended up, but I suspect the store didn’t make it. That’s the thing about technology—it seems to be perpetually, laughably, “almost here” until it is, and then you marvel at how instantaneously it arrived. When Stanley was preaching VR, I was working at my first internet company, trying to convince everyone I knew that the web would be a thing. And then suddenly it was. Within the space of a few years we went from mobile phones being a novelty to not being able to live without them. For more than a hundred years, electric cars have been declared dead, numerous times. Computer scientists have been promising that artificial intelligence was just on the horizon since the 1950s, until it was here, powering the products we use every day. Product people are restless by nature. We’re always dissatisfied with the current state of affairs and fixated on the future. We’re the most critical when it comes to our own particular category. Just as an airplane seems to move faster to an outside observer than to a passenger, it can be difficult to appreciate the pace of innovation when you’re on the inside. Sometimes it’s satisfying to step back and marvel. The best product managers do three things: “Articulate what a winning product looks like, rally the team behind it, and iterate on it until they get it right.” Todd Jackson, VP of Product and Design on how to Find, Vet, and Close the Best Product Managers. I had the privilege of working with Todd at Google, he knows what he’s talking about. The Google Cardboard image is from TrashedGraphics.com. 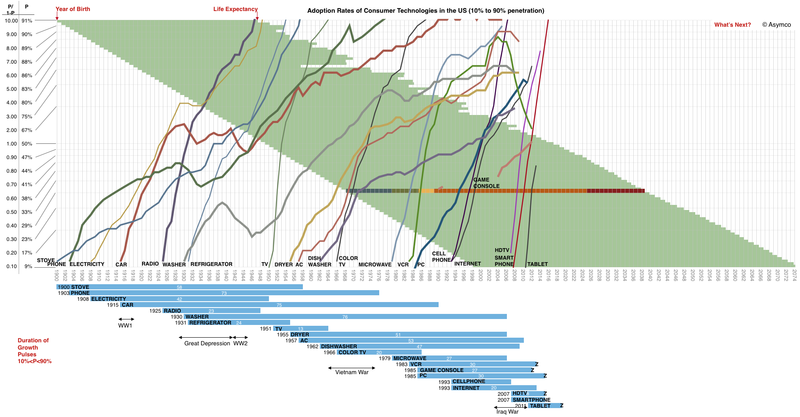 Consumer adoption chart from Asymco.